On June 20, 2017, AMD officially unveiled its new EPYC 7000 Series processor line for one and two-socket servers. These 14nm processors are based on the same Zen architecture as the recent AMD Ryzen desktop processors, with competitive single-threaded performance, along with very high core counts, memory density, and PCIe 3.0 lane counts. These processors are a system on a chip (SoC) that includes CPU, memory controller, I/O controller and Server Controller Hub, so that no separate chipset is required. They have up to 32 physical cores per SoC, along with Simultaneous Multithreading (SMT), so you get 64 logical cores per SoC. You also get eight memory channels per socket, which means 16 DDR4 DIMMs per socket. This lets you have up to 2TB of RAM in a one-socket server, and 4TB of RAM in a two-socket server (with 128GB DIMMs). More realistically, you can easily and affordably have 512GB of RAM in a single-socket server with 32GB DIMMs. You also get 128 PCIe 3.0 lanes per socket, which gives you a lot of total I/O capability. One very nice feature of these processors is that AMD does not cripple the lower-end SKUs when it comes to SMT, memory channels or PCIe 3.0 lanes, which is a big, welcome difference from how Intel does things with their product differentiation. Another difference from Intel (which I actually don’t like) is that AMD does not have higher base clock speeds in their lower core count SKUs, so the existing strategy to reduce your SQL Server core license costs and also get better single-threaded performance by picking “frequency-optimized” low core count (LCC) processors, such as the Intel Xeon E5-2667 v4 is not going to work the same way. What you can and should do, is to pick the fastest AMD EPYC SKU available at a given physical core count. For example, there are three EPYC 7000 SKUs that have 32 physical cores, the EPYC 7501, the EPYC 7551, and the EPYC 7601. Since the SQL Server core license cost will be the same, you should pick the EPYC 7601, to get the most performance possible for your license dollars. Another important caveat is for SQL Server Standard Edition users. SQL Server 2016 Standard Edition has a license limit of four sockets or 24 physical cores, whichever is lower. This means that you need to be very careful what processor you choose for SQL Server 2016 Standard Edition. You basically have five choices to avoid exceeding these license limits. You can get a 24-core EPYC 7401P, or a 16-core EPYC 7351P for a single-socket server. The 32-core EPYC 7551P would exceed your Standard Edition license limit. In a two-socket server, you can choose an eight-core EPYC 7251, and populate either one or two sockets. You can also choose a 16-core EPYC 7351 or a 24-core EPYC 7451 and just populate one socket of a two-socket server. If you buy a new database server that has more than 24 physical cores, SQL Server 2016 Standard Edition will only use 24 physical cores per instance, but Microsoft will still expect you to pay for a core license for every physical core present in the machine. This could be a very expensive mistake. In a worst case scenario, you buy a two-socket server with two of the 32-core EPYC 7601 processor, and end up having to pay about $72K in extra license costs for cores that you are not allowed to use in a single instance. Microsoft has not formally announced any change in these license limits for SQL Server 2017 Standard Edition, but hopefully they will raise these license limits to a more realistic value for modern processors from AMD (and for the upcoming Intel Skylake-SP processors). 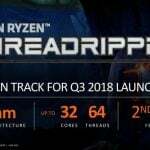 AMD Ryzen Threadripper 2990X CPU-Z Leaks?